Egyptian President Mohammed Morsi told The New York Times that his government will be more independent of the United States. He also lashed out at the previous administrations and bashed Israel. 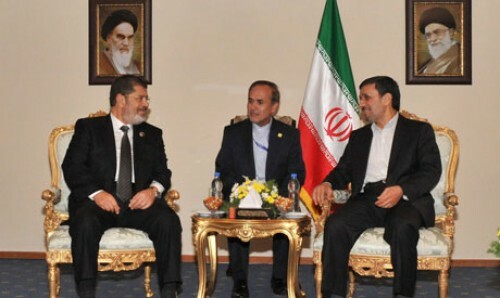 Morsi also held his first talks with Iranian President Mahmoud Ahmadinejad earlier this month. The Obama Administration wants to forgive approximately $1 billion of Egypt’s debt to the United States. This is in addition to about $1.5 billion in annual U.S. foreign aid. And, Morsi certainly has not turned down our foreign aid as he bashes America. On the eve of his first visit to the United States as Egypt’s president, Islamist Mohammed Morsi said he will demonstrate more independence from the US in decision-making than his predecessor Hosni Mubarak and told Washington not to expect Egypt to live by its rules. Morsi sent that message in an interview with the New York Times after a wave of violence erupted across the Muslim world over an amateur film produced in the US that was deemed offensive to Islam and its prophet Muhammed. The film raised news tensions between Washington and Egypt. Morsi criticized US dealings with the Arab world, saying it is not possible to judge Egyptian behavior and decision-making by American cultural standards. He said Washington earned ill will in the region in the past by backing dictators and taking “a very clear” biased approach against the Palestinians and for Israel. Morsi, who was sworn in on June 30 after the first democratic elections in Egypt’s modern history, has been cautious not to sharply depart from Mubarak’s foreign policy path, particularly the longstanding alliance with the United States. Egypt’s general prosecutor wants the death penalty for Americans who blaspheme Mohammad.